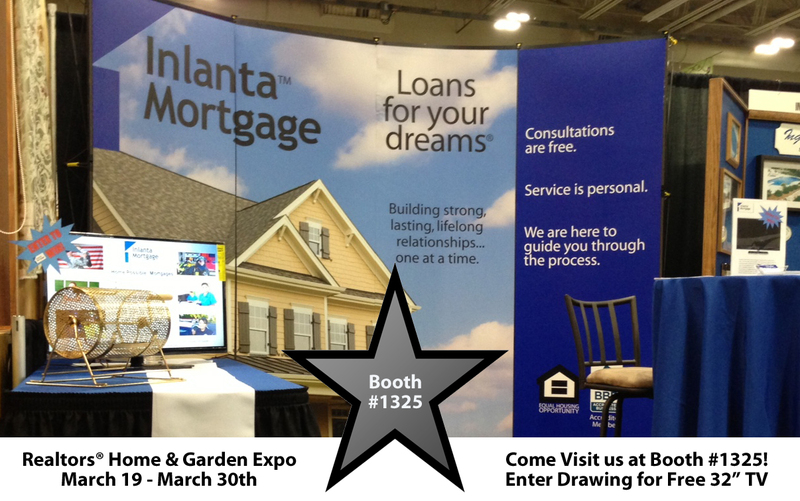 From March 21st through March 30th, Inlanta Mortgage loan officers will be manning booth #1325 at the Realtors® Home & Garden Expo at State Fair Park in West Allis, Wisconsin. Our Brookfield North and Hales Corners offices have partnered together to help spread the news about a variety of loan programs that many home owners and home buyers don’t know about. In addition to sharing knowledge, the loan officers are holding a drawing for a 32″ television. There is no purchase required to enter the drawing for the television – interested parties can simply fill out an entry form at the booth #1325. Our loan officers are eager to share their expertise on the rehabilitation and renovation loan programs that Inlanta offers. Inlanta offers both the FHA 203K Rehabilitation loan program and the HomeStyle® Renovation loan program – both of which allow a borrower to finance both the purchase and renovation of a home. 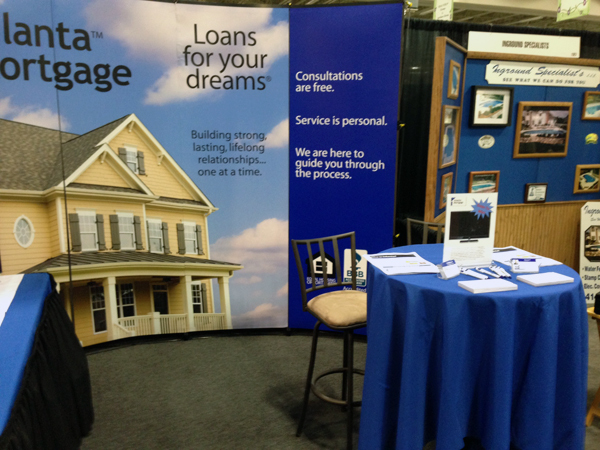 For Home & Garden show visitors wondering how to finance home repairs and renovations offered by a number of expo vendors, stop by and learn more at booth #1325. Managers Lori Jasicki and Tracy Anderson want to also share information on cash-out refinancing options that allow borrowers to take cash out during the refinance process. This cash would be very useful for landscaping, pools and the addition of other outdoor living spaces. Both VA loans and Home Possible® mortgages hold a special place in the hearts of Inlanta Mortgage loan officers. Visit booth #1325 to learn more about no down payment VA loans and Home Possible® mortgages, which are designed specifically for our heroes – police, firefighters, teachers, nurses, and military personnel. Home Possible® is a registered trademark of Freddie Mac. HomeStyle® is a registered trademark of Fannie Mae. Tracy Anderson, Branch Manager of Inlanta Mortgage’s Hales Corners branch, knows all too well how important donating blood is. Tracy herself relied on the generosity of others while experiencing complications during pregnancy many years ago. The complications afflicting her twin sons in utero required a substantial amount of blood. Without the blood donations of others, Tracy knows things would have been much different and maintains a commitment to giving back to this day. Honoring that committment, Tracy has organized her branch’s 2nd Annual Blood Drive scheduled for January 15th from 10am to 2pm. Call 1-800-733-2767 or visit redcrossblood.org to schedule your blood donation appointment. Last year, Tracy’s blood drive was a smashing success, even drawing the attention of Fox 6 News. She hopes to see increasing numbers of blood donors each year! It’s something you can spare – most people have blood to spare… yet, there is still not enough to go around. You will help ensure blood is on the shelf when needed – most people don’t think they’ll ever need blood, but many do. You will be someone’s hero – in fact, you could help save more than one life with just one donation. Tracy Anderson is the branch manager at the Inanta Mortgage Hales Corners branch location at 5300 S. 108th Street Hales Corners, WI 53130. Pictured giving blood: Inlanta Mortgage employee Ashley Duvernell. 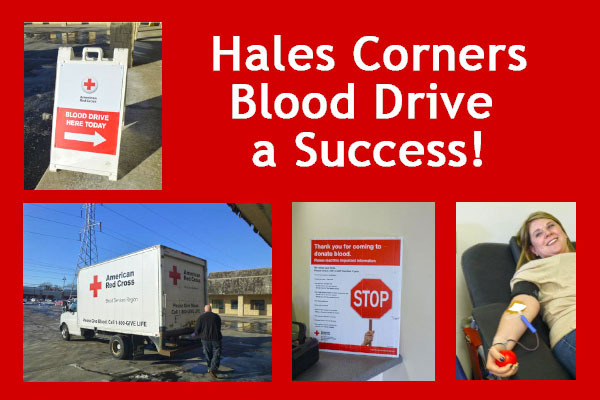 Honoring that committment, Tracy organized a blood drive which was held today – the first for her Hales Corners branch office. According to the helpful and friendly American Red Cross of Southern Wisconsin team on location – today’s blood drive was deemed a success. Amy, Chris, Vicky, Daina, and John gently attended to nervous donators and even turned a few eager donators away (low blood counts, etc.). A team from Fox 6 News stopped by to interview Tracy and follow her through the blood donation process. The segment is scheduled to air on January 15th in between 5 & 6 pm. Tracy hopes to hold another blood drive at her location and increase the number of participants with each drive she holds. The Red Cross was founded on the simple idea of neighbors helping neighbors in time of need. Most of us are aware of the role the Red Cross plays in times of disaster, but did you know they maintain a supply a blood available for distribution 24 hours a day, 7 days a week? Our donations of blood, which most of us have to spare, ensures there is enough blood on the shelf when needed. Our blood donations save lives. In fact, you can help save more than one life with just one donation. Honoring that commitment, Tracy has organized a Red Cross Blood Drive for January 15th at her Hales Corners, Wisconsin office location from 10:00am until 3:00pm. The Hales Corners office is located at 5300 S. 108th Street. 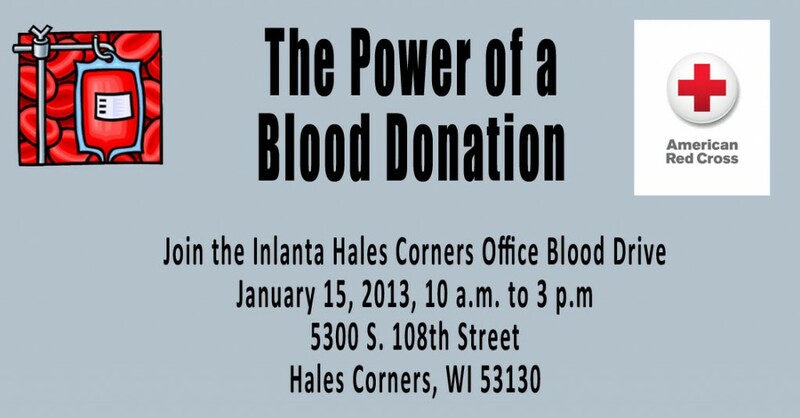 Click here to schedule an appointment to donate blood at the Hales Corners office on January 15, 2013. You may need to filter results by zip code, which is 53130. 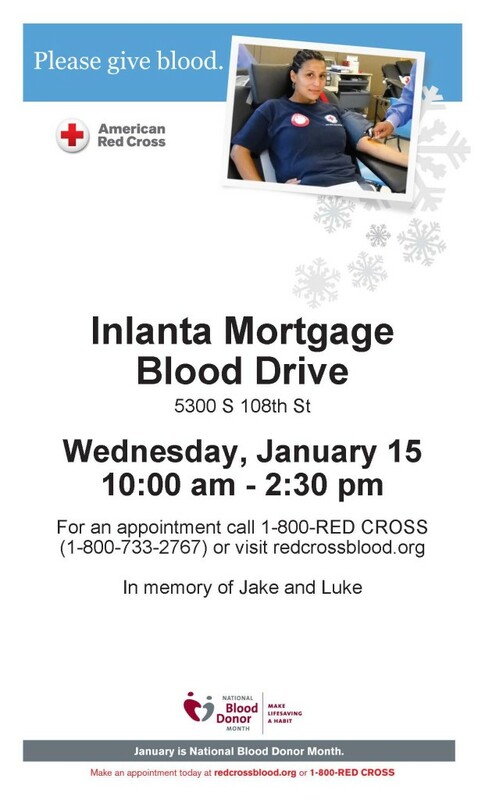 You can also schedule an appointment by calling 800-RED-CROSS. If you have any questions, please feel free to contact Tracy at 414- 425-9555. Inlanta Mortgage is pleased to announce Tracy Anderson and her team in Hales Corners, Wis., has merged with Inlanta Mortgage. Branch Manager Anderson brings more than 20 years of experience to Inlanta, along with a highly experienced team of mortgage professionals. The Inlanta Mortgage – Hales Corners branch can be reached at 5300 S. 108th St., Hales Corners, Wis., 53130 or at 414-425-9555. Find the Hales Corners branch online at http://www.inlanta.com/Hales-Corners/.